With the Cash Stash Keychain, you'll always have some backup currency in case of an emergency. 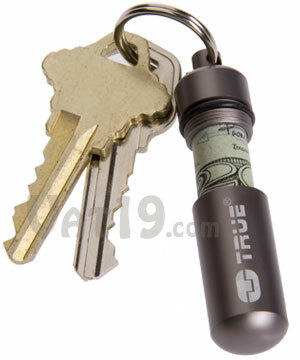 This waterproof aluminum capsule stores one bill for when you or a loved one is stranded without a wallet. The tiny Cash Stash Keychain Capsule is your ticket out of any money-related jam. Perfect for travelers, teenagers, or the perpetually forgetful, the Cash Stash features a waterproof seal and an aircraft grade aluminum body. You never know when you're going to be stranded without your wallet or without any cash. For those emergencies, you'll be covered with the Cash Stash. The tiny waterproof capsule is designed to hold one bill for life's little money emergencies. In case of an emergency, the Cash Stash Keychain Capsule ensures you'll be able to get home. 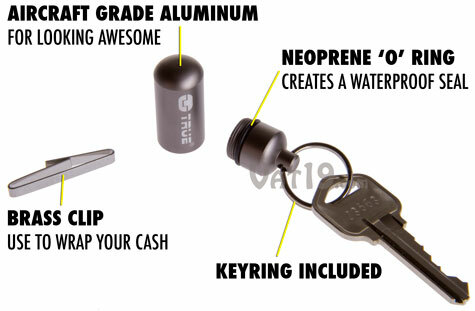 The Cash Stash keychain capsule is perfect for those emergencies in life when you just need a few bucks. This unobtrusive accessory for your keychain is made from aircraft grade aluminum, so it can handle the hard knocks of life on a keyring. The neoprene 'O' ring creates a waterproof seal so your money won't get wet. The included brass clip makes it easier to wrap your bill tightly in order to fit into the 1.75" long CashStash capsule. You'll hardly notice the Cash Stash -- until you need it! 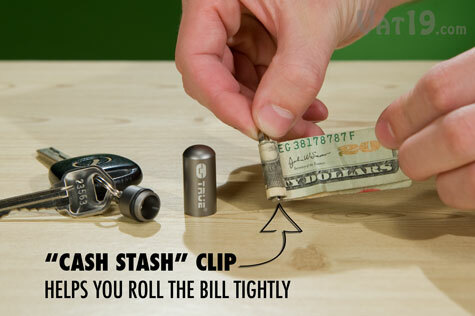 The Cash Stash Keychain Capsule is about as small as a container can be for holding a single bill of currency. It's less than two inches long and only half an inch in diameter. You'll hardly notice this little capsule on your keychain until you've lost your wallet at a baseball game and need to grab a cab home. It's also perfect for teens who have been known to misplace just about everything (except their cell phones and the keys to their precious bit of freedom). The tiny Cash Stash includes a brass clip for helping you tightly roll your emergency cash. Question: But what if I lose my keys? Won't I lose my money? Answer: Yes. That's why you shouldn't carry a $10,000 bill in the Cash Stash. Also, keep in mind that if you lose your wallet, you'll lose that money, too. That's what happens when you lose something; it's gone! Obviously, we suggest not losing your keys (or your wallet). 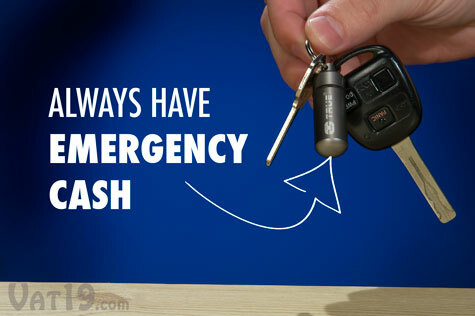 But, emergencies happen and the Cash Stash Keychain will definitely be a life saver if you're stranded without your wallet. Question: How many bills does the Cash Stash hold? Answer: One. We suggest storing a $20, $50, or $100 depending on how dangerous of a life you live. Question: Won't people see my Cash Stash capsule and try to rob it from me? Answer: People see you with your wallet all the time and are you robbed constantly? We kind of doubt it. First, the Cash Stash is pretty small, so most people won't even notice it. Second, you're probably only going to carry $20 to $100 in it, so your robber won't be making off with too much loot. Of course, if you rock a Chuck Norris t-shirt, you'll never even get a dirty look from someone. Question: So, I should totally buy this, right?